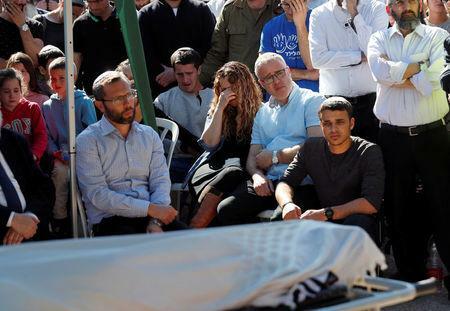 JERUSALEM (Reuters) - An Israeli rabbi died on Monday of wounds from a Palestinian attack a day earlier in the occupied West Bank in which a soldier was killed - an incident that played into Israeli politics three weeks before a national election. The rabbi, Achiad Ettinger, 47, was a father of 12 and a resident of a Jewish settlement in the West Bank. He was shot on Sunday shortly after the soldier was stabbed to death at an intersection on a busy highway in the territory. The Palestinian assailant used the 19-year-old conscript's rifle to fire at the rabbi and wound a second soldier before fleeing in a hijacked car, Israeli officials said. A spokeswoman at Beilinson hospital near Tel Aviv announced Ettinger's death. He was the head of a religious seminary in Tel Aviv. "The people of Israel are mourning the murder of Rabbi Achiad Ettinger," Prime Minister Benjamin Netanyahu wrote on Twitter. On Sunday, Culture Minister Miri Regev, one of Netanyahu's most outspoken supporters in his right-wing Likud, seized on the incident to attack his strongest challenger in the April 9 election, former armed forces chief Benny Gantz. Regev said Gantz, who heads the centrist Blue and White party, would seek the support of an Arab legislator whom she accused of inciting Palestinian violence. Gantz accused Regev of using Israeli deaths for "political propaganda". The Israeli military was still searching for the suspected attacker, identified in the Israeli media as a 19-year-old Palestinian with no known affiliation with a militant organization. Palestinians, many of them individuals without links to armed groups, carried out a wave of attacks in the West Bank in late 2015 and 2016 but the frequency of such incidents has since decreased. Tensions have also been high along the Israel-Gaza border where Palestinians have been holding weekly protests in support of a right of return to lands in Israel from which they fled or were forced to leave in the war over Israel's creation in 1948. On Thursday, Palestinians in Hamas-ruled Gaza fired two rockets at Tel Aviv, causing no damage or injuries. Israel responded with air strikes against Hamas targets. The incidents have highlighted security as an election issue, with both Netanyahu and Gantz promoting themselves as the best qualified to defend Israel.